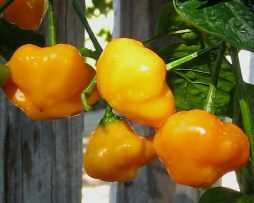 The Trinidad Perfume’s golden fruits have traded gut-wrenching fire for an incredible flavourful, aromatic citrusiness. We can’t emphasise enough how strong a perfume smell(yes actual perfume like) they give off when you cut into them. Its intense…This chilli is what’s classed as a seasoning pepper as it imparts more a flavour than heat. We can’t help but think it would make a marvelous chilli marmalade jam but it would give a fresh salad an interesting twist also. 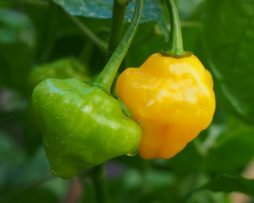 The Trinidad Perfume Golden is similar to the Trinidad Perfume we originally grew but it has a more intense golden colour and the pods start off deep dark green not light green. This one has a less potent perfume aroma and is a little bit sweeter and quite a bit hotter. Pods are 2cm long and 1.5cm wide on average and are a lovely pendant shape. Again we think this one would make an awesome chilli marmalade jam or give a nice aromatic zing to a salad or salsa. Here’s a unique one for the pepper collectors out there. In some Mediterranean regions the making of hot sauce (commercially) is scarce. Instead, chilli paste products are what people consume particularly in the Arab region. The paste is called “Shattah” which stands of course for chilli paste. In these regions chilli paste is used in daily meals much like hummus. 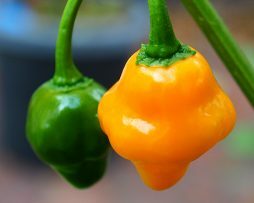 In Turkey, locals use the term (salçalık) to describe the paste made from chillies where this particular pepper has been cultivated as a strain for such a use. Its juicy and slightly sweet like an apple and although we haven’t made a paste out of it we will assume people in the Mediterranean know what they’re talking about. 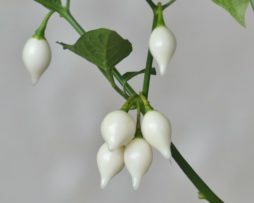 The plant grows to about a meter high in pots and the fruit are approx 2-3cm wide and 6-8cms long. 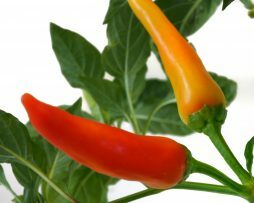 It’s also another chilli that is incredibly easy to grow that is super prolific. Sweet Green pepper in Turkish = Yeşil Tatlı Biber. Like most Turkish Peppers this one is sweet, long, crunchy and super prolific. 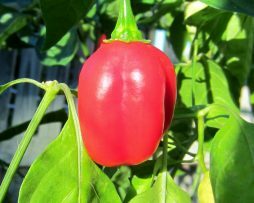 It is said to be among the most used sweet pepper in Turkey and can be found in most rural villagers’ backyards. Given it’s sweetness it is used mostly fresh but we think it makes a very versatile chilli in the kitchen. It has the most magnificent dark green colour which when ripe turns an even more stunning shiny red. Grows quite short so good for small pots and balcony’s. 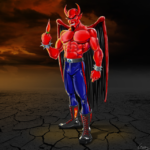 So after growing the Count Dracula chilli how could we resist growing the Vampire. It is just as striking with the fruit also going from a deep black to green and then a BLOOD red…It has the typical annuum characteristics as it’s super easy maintenance/growing whilst pumping out pod after pod all season long. The foliage gets black too if you give it full sun which makes it even more of a growing temptation. Taste wise you wont be disappointed as the Vampire fruit are medium thick walled with a sweet and juicy tang that’s only moderate in heat. Pods on average are about 6cm long and 2 cm wide with the plant growing about a meter in a pot. We love the Yellow Brazilian Starfish. 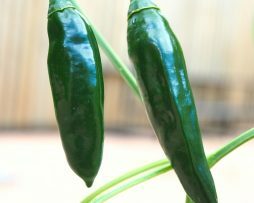 While it doesn’t have much heat at all, around the same as a Jalapeno, the taste is great. The first thing you can taste is apples. It is thick walled and crunchy, also very prolific! The little heat it does have presents itself as almost “fizzy”. Its very unusual! These are great tossed into a salad. 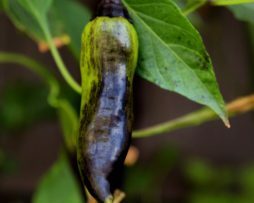 Although still rare, its one of the best mild chilies ever!